A stylish weave design ring combining silver, cubic zirconia and 9ct yellow gold. Have the best of both worlds with this mixed metal ring. 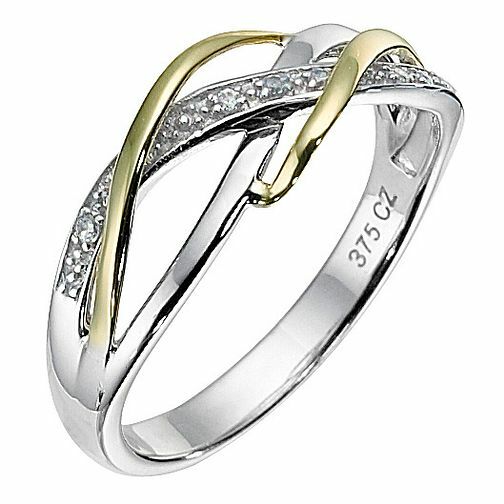 9ct Yellow Gold and Silver Cubic Zirconia Weave Ring is rated 3.6 out of 5 by 5. Rated 3 out of 5 by Anonymous from Lovely but thin gold I was really happy with the design of the ring, however the gold bands are of poor quality. The first one I had, one of the gold bands detached itself from the silver. The second one, both gold bands were deformed very quickly. All this appeared to because how thin the gold was making it damage very easily It was a real shame because I really liked the ring it was just not good enough quality. H Samuel was really good about it though, helping me each time I came it with excellent customer service.